More than Irish eyes will be smiling when guests are presented with these Love Knot bottle stoppers! The inspired Celtic wedding favors each feature a Shamrock/Trinity Love Knot charm on top. The knot is believed to represent the three promises of a relationship such as to love, honor, and protect. 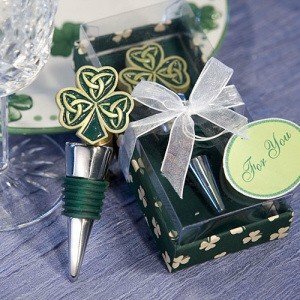 The silver bottle stoppers feature a black rubber gasket and are individually gift boxed in a package with clear top, shamrock base, white organza ribbon and matching "For You" tag. Each favor measures 4.5" x 1.5" x 1". Fantastic Irish party favors to thank guests for sharing in your special day! It does not have any personalization options, but you can find our personalized tags, stickers, ribbon, etc. that are sold separately by clicking here. I need 96 pieces of the trinity love knot bottle stoppers. Do you have them in stock and can I get them this week by Thursday in Atlantic City, NJ? Yes, the Trinity Love Knot Bottle Stoppers is in stock. Most non-personalized orders are typically shipped out in 3-5 business days. If you order today, the soonest we can send it to you is on Friday (07/06) through rush shipping. Are these Trinity Love Knot Bottle Stoppers made of metal or plastic? They are made of metal, with a plastic top.